Read it for yourself. There are at least 7 leadership lessons we can learn from this. 2) Don’t blog/email/tweet when you’re angry. You will regret it later. 3) If you’re a public figure, hire a gate-keeper/media manager who you run your public communication through before it becomes public. 4) Always take the high road. 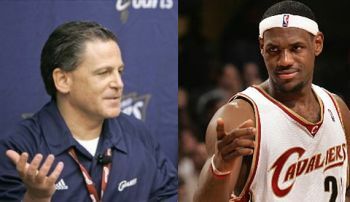 I don’t know LeBron James’ character or what happened behind the scenes. But even if he is everything Gilbert called him and more, it’s just classless to insult a person publicly. 5) Don’t promise things you can’t possibly deliver. It just makes you look like you’ve lost all grip of reality. Gilbert wrote, “”I PERSONALLY GUARANTEE THAT THE CLEVELAND CAVALIERS WILL WIN AN NBA CHAMPIONSHIP BEFORE THE SELF-TITLED FORMER ‘KING’ WINS ONE.” Please. All this says is you want to show LeBron up. 6) When you sound like you’re out-of-control, manipulative, and classless, you lose all public sympathy, and you give everyone you’re criticizing justification for getting as far away from you as possible. 7) As a leader, when you look like an idiot, you embarrass everyone around you. I feel bad for the rest of the Cavs organization and Cavs fans. Don’t rant in comic sans font. It will only make you look more ridiculous. This letter is embarrassing not only for Dan Gilbert but also for the entire the entire Cleveland Cavaliers organization and the entire city of Cleveland. There will be damage control. He will probably issue a carefully crafted mea culpa apologizing, citing passion for the Cavs, emotions getting the best of him, etc. But Gilbert will never be able to live this down. Your thoughts on the now infamous letter? Other lessons learned from it? Advertise for FREE on LiveIntentionally.org in July!